Focus Workshops - Wade Institute for Science Education | Inquiry-based, hands-on, minds-on, science, technology and engineering professional development for K-12 teachers and informal educators. Focus Workshops are 2-day professional learning opportunities that provide a deep dive into content and inquiry investigations focusing on one STEM discipline. Connect with scientists and educators from the Wade Institute for Science Education and Mass Audubon, gain an understanding of the power of inquiry-based learning to inspire a passion for science in students, and come away energized! During this two-day professional development workshop, experiment with renewable energy technologies to understand how they can be used to produce sustainable electricity and reduce human impacts on the climate. Engage in hands-on, minds-on activities as you build a solar-powered fountain, design the best blades to catch the wind, and compete to fill an electrical grid with the most effective energy sources. Discover first-hand how wind turbines and solar panels generate power, and why communities are relying increasingly on these systems to meet their energy needs. Lighting the Way with Wind and Solar: Pathways to a Sustainable Energy Future will integrate science content with the Science and Engineering Practices. Find out more about how energy, climate change, and sustainable solutions connect to the 2016 MA Science and Technology/Engineering standards. Walk away with inquiry-based activities and a kit of equipment you can use to get started with your own students. Check back for upcoming dates for this program! A one-day workshop for curriculum and school leaders offered by the Massachusetts Science Education Leadership Association (MSELA) and the Wade Institute for Science Education. Examine aspects of the Frameworks that are essential to a smooth and effective transition to the new STE standards! Contact the Wade Institute at 617-328-1515 or wadeinstitute@wadeinstitutema.org! SeaPerch is an innovative underwater robotics program that equips teachers and students with the resources they need to build an underwater Remotely Operated Vehicle (ROV) in an in-school or out-of-school setting. Working models of an ROV are built from a kit comprised of low-cost, easily accessible parts, following a curriculum that teaches basic engineering and science concepts with a marine engineering theme. Students who participate in SeaPerch programs become engaged in learning engineering concepts, problem solving, teamwork, and technical applications. Engineering and science activities using the ROV are also explored as well as citizen monitoring programs. The Wade Institute partners with the national SeaPerch program to provide SeaPerch workshops for middle and high school educators. 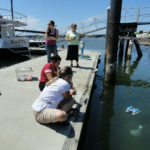 These workshops train teachers, mentors and potential trainers how to build these working models of remotely operated vehicles (ROVs) and develop a SeaPerch program for their school or institution. SeaPerch programs can be part of the classroom curriculum or after-school enrichment programs. Curriculum resource materials are provided which support the Science and Technology/Engineering Standards bringing together basic engineering design skills and the science practices. Concepts incorporated into the curriculum resource materials include marine science, oceanography, biomimicry, ocean engineering, physics, robotics, mathematics and marine related careers. The Wade Institute offers SeaPerch Educator Workshops as requested by schools and school districts. In these 2 day workshops, classroom teachers and informal educators build their own SeaPerch and explore how this ROV can be used in the classroom and field. As part of the workshop, educators receive their own kit to use in the classroom along with the SeaPerch curriculum guide. These workshops can also be organized to accommodate student/teacher teams. To arrange a SeaPerch Workshop for your school or school district, contact the Wade Institute at wadeinstitute@wadeinstitutema.org or 617-328-1515.